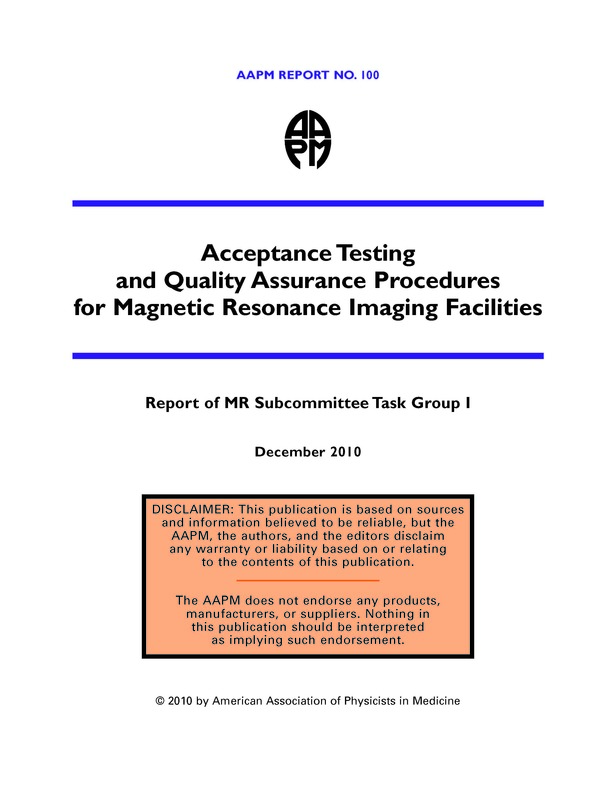 This document was prepared to assist the medical physicist in defining an acceptance test strategy and quality assurance procedures for magnetic resonance imaging (MRI) facilities. Due to the wide variety of MRI systems available, with an equally wide range of options on each type of system, this document does not seek to provide a definitive guideline for development of such procedures. Instead, the goal of this document is to provide suggestions for relevant, practical tests that qualified medical physicists can perform independently or with the assistance of the magnetic resonance (MR) system vendor’s service personnel. The docu- ment outlines a recommended general testing strategy, overviews phantom availability/ preparation issues, and then lists individual tests, each with a rationale for performing the test, a suggested procedure, and, where appropriate, suggested acceptance criteria. In some cases, alternative procedures are also provided. This document was developed to replace the now dated reports of the American Association of Physicists in Medicine (AAPM) Magnetic Resonance Task Group 11 and Task Group 62, although some materials from these original reports are referenced in the current document. This document also refers to specific tests and acceptance criteria based on the American College of Radiology (ACR) MR Accreditation Program MR phantom testing doc- uments3,4 and the ACR MRI quality control (QC) program documentation.5 The rationale for specific inclusion of selected ACR phantom tests was made based on the large number of ACR-accredited MR facilities and, therefore, the widespread availability and use of the ACR MR Accreditation Phantom. For ACR phantom tests, it should be noted that some acceptance criteria given in this document differ from action criteria noted in the ACR MR Quality Control Manual 20045 and/or MRI Phantom Test Guidance4 document. In such cases, the criteria rec- ommended herein exceed the requirements suggested by the ACR, as acceptance testing should establish the optimal operating characteristics for the MR system. Currently, the level of rigor in acceptance testing of MRI systems is highly variable, ranging from acceptance based on first patient examination, with no involvement of persons other than the vendor’s service/installation personnel, to highly rigorous acceptance testing procedures. However, several changes in the clinical practice of MRI are causing the MR com- munity to re-evaluate the prior and current levels of acceptance testing and quality assurance programs. First, increasing numbers of imaging centers are using MR image data for treatment planning (surgical as well as stereotactic and conformal radiation therapy applications) or for actual guidance during interventional procedures. These applications require increased diligence in ensuring that MR systems are optimally calibrated (and appropriate acquisition techniques are utilized) such that the spatial accuracy of the resulting images is suitable for the intended purposes. Second, the ACR MR Accreditation Program requires that its accredited facilities adhere to the ACR Practice Guideline for the Performing and Interpreting Magnetic Resonance Imaging (MRI) and the ACR Technical Standard for Diagnostic Medical Physics Performance Monitoring of Magnetic Resonance Imaging Equipment, which include requirements for both acceptance testing and quality assurance programs. (All ACR Standards, including those cited above, are available at http://www.acr.org.) Medical physicists, with adequate training, experience, and continuing medical education in MR physics, are clearly ideal candidates to develop and to supervise such procedures. Given the ever-increasing range of MR applications, from exquisite anatomical imaging to functional imaging and spectroscopy, it is important that site-specific applications of the MR system be considered in the specifications, bid reviews, and acceptance testing and quality assurance program development. These site-specific applications affect the selection of the tests to be performed in addition to the particular acceptance criteria for a given test. For example, systems that will be used for ultrafast imaging and/or spectroscopy will have more stringent magnetic field homogeneity and eddy current correction criteria than will systems that will be used only for routine imaging applications. Once the site preparation and system installation procedures begin, it is strongly recommended that the physicist have regular involvement with the monitoring of these proce- dures. Site planning for MR systems has numerous unique requirements relative to other imaging modalities, and poor construction practices can easily turn into serious “artifact generators” later. Valuable time can be saved if the physicist has regular interaction with the construction contractors, RF shield installation team, and, of course, the MR system installa- tion personnel. Furthermore, as outlined below, certain system and site installation tests require test equipment that is not readily available to the practicing medical physicist. If, how- ever, the physicist is present during such tests, and understands the details of the tests being performed, there is no reason such test data cannot be used as part of the acceptance test and form the foundation for any subsequent quality assurance program. Acceptance testing is by definition the determination of whether the system delivered and installed is the system that was mutually agreed upon by both the buyer and the vendor and whether the system performs as specified in the contract. Therefore, access to and review of the original contract or sales agreement is highly desirable. All items related to the system should be clearly specified, including all RF coils, imaging options and pulse sequences, processing features, networking and filming options, etc. Ideally, the nominal performance criteria for key features, such as field homogeneity, should be provided in the contract. With this document in hand, and knowing the targeted applications of the MR system at the particular site, the medical physicist can fine tune the acceptance test procedure and recommend relevant aspects of a continuing quality assurance program.